The RAN binding protein 10 (RANBP10) is a cytoplasmic guanine nucleotide exchange factor that shares high sequence similarity to the MET-interacting protein RANBP9. RANBP10 is expressed in the cytoplasm of mature megakaryocytes (MKs) and platelets where it localizes to polymerized noncentrosomal microtubules. RANBP10 possesses guanine nucleotide exchange factor activity towards RAN, a GTPase involved in nucleocytoplasmic traffic, spindle formation at mitosis, and nuclear envelope assembly during telophase, suggesting that RANBP10 may also be involved in these activities. RANBP10 depletion in vitro caused the disturbance of polymerized filaments in MKs and platelets in RANBP10-null mice exhibited disorders in microtubule filament numbers and localization, indicating that RANBP10 may play a significant role in maintaining microtubule dynamics. 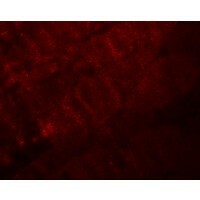 Western blot analysis of RANBP10 in human skeletal muscle tissue lysate with RANBP10 antibody at (A) 1 and (B) 2 ug/mL. 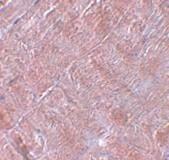 Immunohistochemistry of RANBP10 in human skeletal muscle tissue with RANBP10 antibody at 5 ug/mL. Immunofluorescence of RANBP10 in mouse skeletal muscle tissue with RANBP10 antibody at 20 ug/mL.